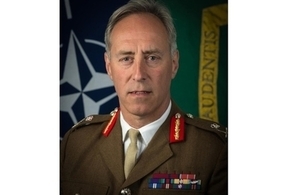 Lieutenant General Tim Radford has been appointed NATO’s Deputy Supreme Allied Commander Europe (DSACEUR), demonstrating the leading role the UK plays in the transatlantic alliance. Crown copyright. Lt Gen Radford, who has previously served as the Deputy Commander of NATO’s Op Resolute Support in Afghanistan and Commander of the Allied Rapid Reaction Corps in Gloucester, takes over from fellow Brit, General Sir James Everard, in Spring 2020. It’s a great honour to have been selected to serve as the next Deputy Supreme Allied Commander Europe at a time of significant transformation within NATO. In NATO’s 70th year, the alliance retains all its relevance as the cornerstone of European security and I commend the work General Everard has done in maintaining that. The appointment of Lt Gen Radford embodies the role the UK plays in NATO – one of leadership and commitment. The UK currently has thousands of troops stationed across the globe standing shoulder-to-shoulder with NATO allies. In the Baltics, the UK has over 1,000 troops, Challenger II tanks, and Wildcat and Apache helicopters deployed as part of NATO’s Enhanced Forward Presence, the largest commitment of any nation. Later this year, four RAF Typhoons will return to Estonia, where they conducted Air Policing in 2016, and, for the first time will patrol Icelandic skies. This will allow the UK to work closely with allies to deter aerial threats to Euro-Atlantic security. In Afghanistan, there are over 900 UK troops mentoring the next generation of Afghan military leaders and leading the Kabul Security Force, providing vital protection to over 8,000 NATO mentors and advisors working within the city. NATO is the bedrock of Euro-Atlantic security and later this year the Prime Minister will welcome NATO Leaders to the UK to strengthen the bonds that have maintained peace for the last 70 years and will do so well in to the future.